I can create and put together a beautifully styled room like nobody's business BUT, I cannot stay organized and schedule anything to save my life! This doesn't work for me as a blogger. It doesn't work for me in any aspect of my life, actually. I'm a carefree guy who lives life a day at a time. I like the fact that I can be spontaneous and flexible enough to just "go with the flow" and I can still be that way, just not with everything. OK , so I have my planner, my highlighters... now what? My good friend, Erica Reitman saw my cry for help. I posted a story on snapchat where I was basically just sitting there, staring at my blank planner not knowing where the hell to start. Well, Erica saw my post and the next day, she snapped a story explaining how she schedules EVERYTHING on her content calendar! I swear, this lady is a GOD SEND! If you don't already follow Erica Reitman, please do yourself a favor and check her out. If you love sarcasm, dry humor, reality shows and tips on decorating, YOU WILL LOVE ERICA! Check out Erica's Instagram profile @EricaReitman. 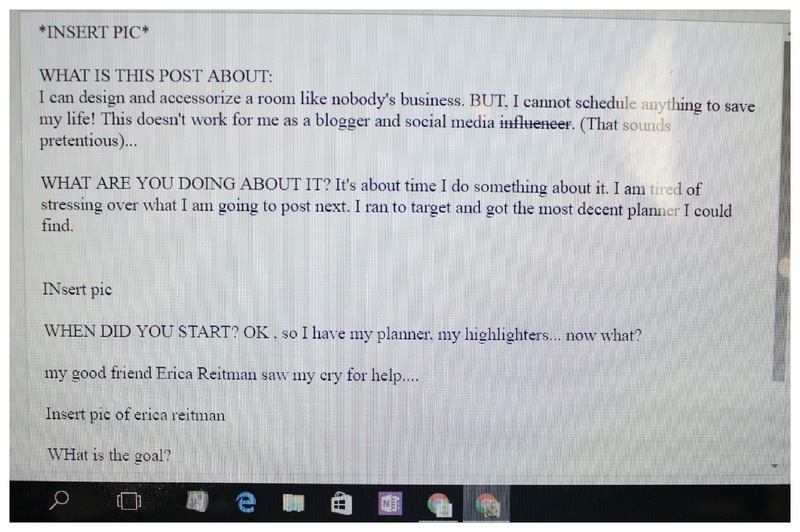 OK, I'm going to share what Erica explained to me about how she schedules her social media content in hopes that I help others, just like she helped me. I'm going to simplify my version into two simple steps. 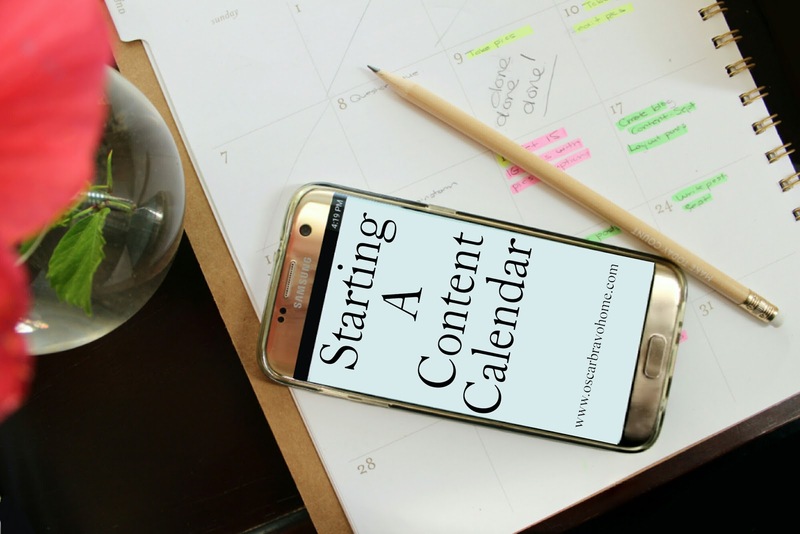 Here are two basic steps to get you started on your content calendar. STEP ONE: WRITE DOWN ALL SOCIAL MEDIA TASKS YOU NEED TO DO FOR THE MONTH. ALL.OF.THEM. From picture taking to brainstorming for your content, write it all down. STEP 2: BATCH YOUR TASKS. ASSIGN A DAY/S FOR TASKS. Working on only one type of task on a scheduled day really helps you stay focused and actually accomplish the day's goal. Based on your needs you can have picture days, writing days, Instagram days, and so on. For example; at the end of the month, I schedule a "create blog content" day. ALL that I do this day is brainstorm blog topics that I am going to write about for the following month. I ONLY do that on that day! This is the key to making this work. Schedule a day (or more than one day if needed) for one type of activity. This method has really helped me stay focused and actually get A LOT of things done! So, instead of coming up with an idea, setting up, taking the pics, editing the pics and writing the blog post aaalllllll in one day, you schedule days for certain tasks! After you brainstorm and come up with your blog content , I want you to schedule a day to lay out your blog posts and save them as drafts. I recently started doing this and it is SUCH A TIME SAVER. Let me explain to you what I mean. Once you have the subjects for all of your blog posts, go into your blog and start a new post. Add your post title and then start on the body of your post. Create a template of your blog post. Start with your opening sentence, then maybe the first lines of a few paragraphs, then your closing sentence. I even type in *INSERT PHOTO HERE* on my draft so I know where to put my pictures. Once I am done with my blog outline, I save the post as a draft so I can get to it later, on my scheduled writing day. On my "writing day" all I do is fill in the blanks to complete my post! Peeps I am no blogging expert, believe me, but I'm definitely learning as I go. If you feel that maybe this can work for you, then give it a try! I am about two weeks into it and I already love it! I hope this method works for you! To get you going in the right direction, I added a few planners that I happen to come across that I think are both stylish and functional. If you all have any questions about batching and scheduling posts, let me know in the comments and I'll be more than happy to answer them for you. Erin, you are absolutely right! Scheduling one day for pics eliminates the need to clean all the time lol!! That in itself is such a time saver! I hope you are able to incorporate this batching business to your posts too and that it helps! This is really great advice, and exactly what I needed. It makes so much sense to focus on one task each day and lay out the entire month in advance. I'm still figuring out the social media part of scheduling. Do you focus on Pinterest (or FB/IG, etc...) scheduling one day each week? I would recommend you kinda estimate how much time you need for each social media outlet. 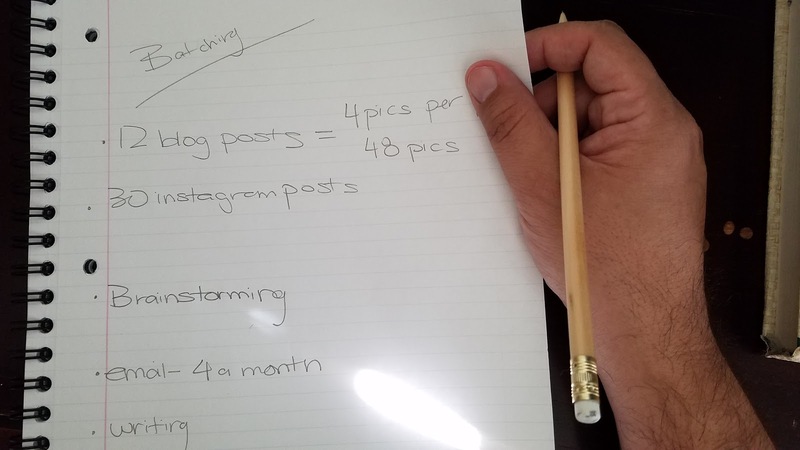 If you like to post daily on fb and IG, think about how much time you will need to make 30 posts. Maybe a 2-3 days to be safe. For pinterest, maybe schedule 1 hr every other day to post. The first month might be experimental as far as time goes, but afterwards you will know how much time you need. Thanks for visiting, Colleen and I hope it helps! Here's a big virtual hug for you!!!! 🙌 thanks for reading! I feel you! I was the same way! I had no idea where to even begin. This batching method is so simple to start.you might be cramming two months worth the first month but afterwards it should be a breeze! No problem, T!! I love helping out! Remember, we got this! !